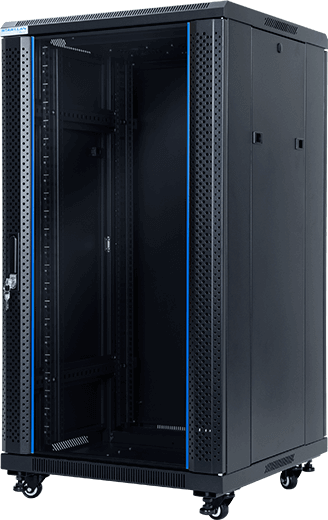 A floor-standing telecommunication rack cabinet that meets the 19” rack cabinet standard requirements. It is a perfect solution for network systems at small and medium enterprises. The rack cabinet is packed in two flat cartons for easier transport and storage. Its simple design makes the assembly quick and easy. Start.Lan solutions are a response to practical challenges faced when building a computer network or monitoring system. We adapt our range and individual products to the guidelines from our customers: network administrators, integrators and installers. We listen to what they say in order to make easier their daily work on creating data transmission infrastructure for a wide range of customers from all economic sectors. We know budgets are important. For most customers, the price is often crucial. We also know that the customers want to get high-quality products even with lower budgets. In the end, your network infrastructure is to work for years! Therefore, we optimise our products so to save on less important components while focusing on the crucial ones. You will see it when reading our product specifications: each product is described in detail. Our products undergo strict testing. This allows us to provide a warranty for their manufacturing and operation. However, we are here to help you if anything goes wrong. Need support? Contact us. Please also visit our YouTube channel, where we show how to assemble our rack cabinets or perform installation works. Is our offer missing a rack cabinet that you need for your project?